The Victorian Doll House came into being during the Victorian Era when Britain was experiencing much prosperity. The educated middle class at that time were developing and many household items evolved along with many new toys. In general the early dollhouses were not built for children but for adults. Children were not allowed to play with them. Not for the safety of the child but for the dollhouse. Basically isn't that where the hobby is today? In the adult world? Would you let a child play with your collector dollhouse? We thought not! We adult children don't have to share our toys. It's just the way it is. 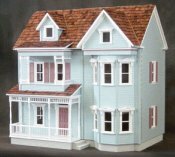 The dollhouses of the earlier eras like the Victorian Era were build and displayed for collectors and worth as much as a full size house of that day. So it would seem if you happen upon one of those gems, think twice about tossing it into the trash. Definitely, to put it quite mildly, it's worth something. Today they are one of the most popular designs around offline as well as online. Featuring an array of curved front exteriors and very imaginative precise furnishings, they still captivate their large audience. Thanks to many enthusiasts that help keep this art form alive. Just imagine traveling back in time to that romantic era. The long flowing gowns and classy get-togethers. At an historical village where we live, the site has a system whereby little children can become visiting cousins and stay on-site to learn and explore what it must have been like way back when. With an engaging miniature design you literally can become your own form of visiting cousin. As you study and perfect your dollhouse it can become your second home. And just think, it's a home where nothing happens except good times. Ahhhh! The pure joy of creation! and your own little world! 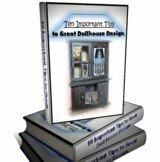 Next continue your journey to Great Designs by visiting our article: The Nostalgic German Dollhouse.